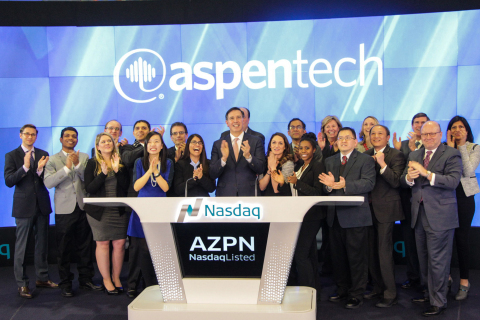 Aspen Technology, Inc. (NASDAQ:AZPN) , a leading provider of software and services to the process industries, rang The Nasdaq Stock Market Closing Bell on February 4, 2015 at the Nasdaq MarketSite in New York City. CEO and President, Antonio Pietri presided over the ceremony where he was joined by members of the executive leadership team and other AspenTech employees to perform the honorary ringing of the closing bell. For over 30 years, AspenTech has developed software that optimizes the design and operation of process manufacturing plants, and the management of supply chains of the world’s biggest energy and chemical companies. The bell ringing ceremony commemorates the company’s 20 year anniversary on The Nasdaq Stock Market. Information about AspenTech’s closing bell ceremony including photos and a video replay of the event can be found at NASDAQ website or on AspenTech’s Facebook and Twitter (@AspenTech) accounts. AspenTech is a leading supplier of software that optimizes process manufacturing – for energy, chemicals, pharmaceuticals, engineering and construction, and other industries that manufacture and produce products from a chemical process. With integrated aspenONE solutions, process manufacturers can implement best practices for optimizing their engineering, manufacturing and supply chain operations. As a result, AspenTech customers are better able to increase capacity, improve margins, reduce costs and become more energy efficient. To see how the world’s leading process manufacturers rely on AspenTech to achieve their operational excellence goals, visit www.aspentech.com. (c) 2015 Aspen Technology, Inc. AspenTech and aspenONE are trademarks of Aspen Technology, Inc. All rights reserved. All other trademarks are property of their respective owners.